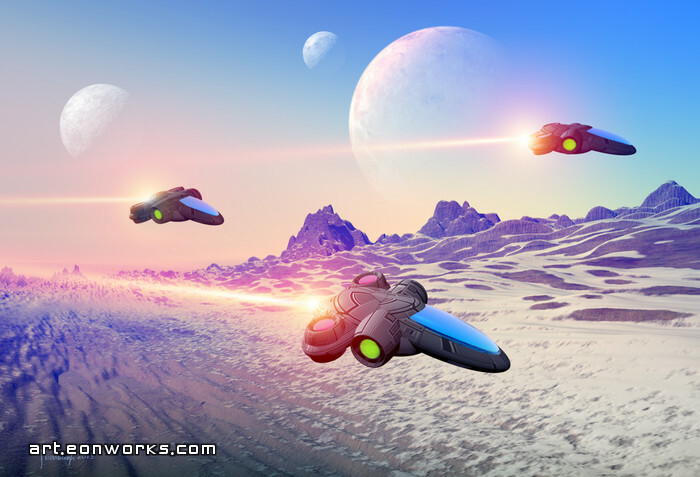 28 February 2013  In 2010 I did the first image in this series, and I decided to do a second one as I really like the idea of spaceships flying above a terrain. I actually plan on doing more sci-fi work in the near future. I'm also experimenting with various techniques as I want to change my style a bit. In the past I did some complex and time consuming work, but now I want to simplify certain aspects of my work and at the same time make better images. Another news is that I'm in the process of lowering my costs of operation. Because of this I decided to learn Blender, a free 3D program. Last time I used Blender must have been at least a decade ago and the program has progressed tremendously since then. So far I have only been exploring modeling and texture mapping and a little bit of rendering. There are a couple of things I can't get to work quite right and I'm not sure if that is due to a bug or me not doing things the right way. Overall, however, I really like Blender. The new user interface is great and there are shortcuts for everything. Nevertheless, after years of using 3DS Max it does take some time to get used to a somewhat different way of doing things. I don't have anything to show yet, but hopefully will have something relatively soon. Looks Awesome - I wonder what type of energy they use! There is so much being discovered these days in the realm of Physics. Perhaps someday what we are unraveling will lead to better propulsion systems in the future.